Circus Circus Las Vegas features circus acts and carnival type games daily on the Midway. Circus Circus has the only RV park on the Strip providing additional accommodations in the 399 space park operated by Kampgrounds of America (KOA). Circus Circus Las Vegas is the largest permanent big top in the world. 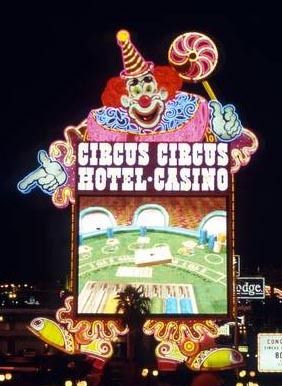 The clown marquee at the entrance was provided by Young Electric Sign Company, and was constructed in 1976. Casino: Yes, 107,500 square feet. Casino games include Blackjack, Caribbean Stud Poker, Craps, Let It Ride, Pai Gow Poker, Poker, Roulette, Slots, Casino War, and Megabucks. The casino has a poker room. Race & Sports Book: Yes, a 80-seat race and sports book, equipped with 68 televisions and 18 big screens. Restaurants: Circus Circus has the following dining options: Barista, The Garden Grill, Circus Buffet, Pizzeria, Mexitalia X-press, The Steak House, McDonald’s, Westside Deli, Krispy Kreme and Rock & Rita’s. Entertainment: Free circus acts, 11:00 a.m. – midnight daily. No reservations required. Attractions: Adventuredome, Canyon Blaster, Chaos, Inverter, IMAX Motion Rides, Rim Runner, Sling Shot. Pool: Yes, three pools, one in the RV Park and two at the Skyrise Tower, and three spas. Spa: No, but there is a salon, Alexandra Noel. Shops: 40,000-square-foot shopping promenade with 20 retail outlets — from keepsakes to apparel — including The Criss Angel MINDFREAK Superstore. Wedding Services: Yes, the Chapel of the Fountain offers a number wedding ceremony packages. Convention Rooms: Yes, banquets and meeting space for up to 600 people. Room Service: Limited room service available. Hotel Amenities: Currency exchange, laundry service, luggage service, maid service, safety deposit box, valet parking, video check-out, wake-up call. Parking Garage: Yes, there are three garages for your convenience. RV Park: Yes, Circus Circus offers 399 spaces with full-service utility hook-ups. Within the RV park’s grounds guests have access to a 24-hour convenience store, arcade, laundromat, playground, pet runs and disposal stations. Standard Room Amenities: Standard Tower room amenities include air conditioning, alarm clock, remote-controlled cable TV, electronic door locks, hair dryer, in-room safe, iron and ironing board, pay-per-view movies, radio, telephone, voice mail and a small table with chairs. Manor rooms are two-star rooms. They are smaller and have fewer amenities. Manor rooms are located a half block behind the main resort building in five three-story buildings. There is a walkway from the manor rooms to the main resort. Policies: Children 17 and under stay free with an adult. The maximum total number of guests (adults and children) in a room is four. Incidental Charges:Hotel requires a credit card for incidental charges. Circus Circus charges a mandatory $7.95 resort fee plus tax per day to be collected from the guest upon registration. Upon paying the fee, guests will receive a Circus Circus Las Vegas “Resort Passport Booklet” ($150 value) which includes: A coupon for two free drinks at West Casino or Slots a Fun Bar (or $5 credit towards other beverage purchase); savings for retail, food and beverage, gaming and The Adventure Dome (One passport book per room); free local and toll-free calls (up to 30 minutes per call); free in-room wireless internet access.